Pressure is mounting on the Election Commission to dissolve the Thai Raksa Chart Party for nominating Princess Ubolratana as its prime ministerial candidate, even though it has now agreed to withdraw the nomination. Paiboon Nititawan, leader of the pro-military People Reform Party, said the EC must act following the rejection by His Majesty the King of his sister’s surprise entry into politics. The announcement published in the Royal Gazette was televised nationally late Friday after the princess was registered as the prime ministerial choice of Thai Raksa Chart, a party linked with ousted ex-prime minister Thaksin Shinawatra, earlier in the day. Thai Raksa Chart issued a statement on Saturday saying that it “has accepted the royal command”. “The Thai Raksa Chart Party deeply appreciates Princess Ubolratana’s kindness to the party. The party will carry out its duty in compliance with the Election Commission’s regulations, the election law and the constitution with respect to royal traditions,” the statement said. The decision leaves Thai Raksa Chart without a designated prime ministerial candidate. Prior to the shock announcement of its choice of the princess, it had been widely believed that chief strategist Chaturon Chaisang would be the party’s standard bearer in the March 24 poll. Mr Paiboon earlier on Friday had submitted a letter to the EC asking that it order Thai Raksa Chart to suspend its nomination of Princess Ubolratana. On Saturday he said it was evident in the royal announcement that the nomination of the princess was linked to the monarchy, whose members could not be involved in politics. Thai Raksa Chart must end everything, he added. The King made clear in the statement that although the princess had relinquished her royal title by law, she is still a royal family member by tradition. Princess Ubolratana still performs activities on behalf of the royal family, the statement added. Bringing a high-ranking member of the royal family to politics, in whatever manner, is an act in violation of royal tradition and national culture and highly inappropriate, according to the announcement. He cited Section 92 of the 2018 Political Party Act, which stipulates that the EC, after obtaining credible evidence that a political party has committed an act deemed hostile to the constitutional monarchy rule, must propose the dissolution of the party to the Constitutional Court. 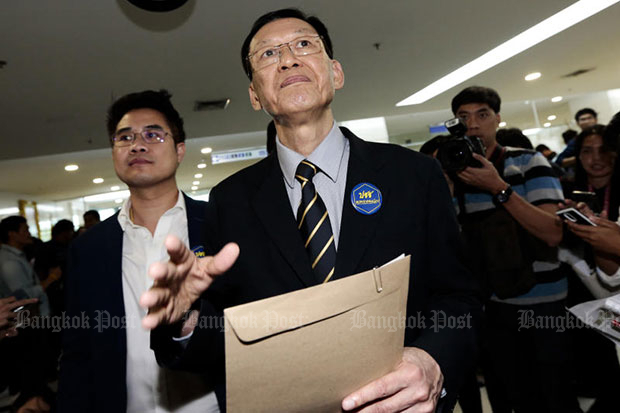 Mr Paiboon called on the EC to meet on Monday to consider dissolving the party. Prapan Naikowit, a former election commissioner and former member of the constitution drafting panel, said the provisions in Section 92 were nothing new. They had been included in the previous political party law. He said the EC had to consider whether the action of Thai Raksa Chart was serious and warranted dissolution. It could use its own judgement to decide whether to seek a Constitutional Court ruling, he added. Meanwhile, Princess Ubolratana thanked her supporters on Saturday, saying she wants Thailand to be "moving forward", but did not comment on her prime ministerial candidacy. "I would like to say once again that I want to see Thailand moving forward, being admirable and acceptable by international countries, want to see all Thais have rights, a chance, good living, happiness to all," she said, concluding with the #ILoveYou hashtag. Thai Raksa Chart on Saturday cancelled its campaign appearances scheduled for the day in Pathumwan, Bang Rak, Sathon, Bang Kholaem and Yannawa districts of Bangkok, without giving reasons.